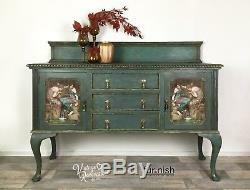 Green/Blue and Gold Vintage Sideboard Decoupaged with Old Masters Prints. 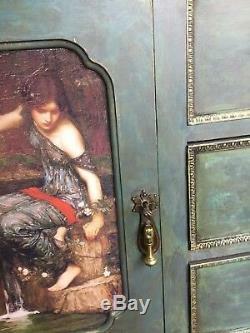 Beautifully romantic, solid wood sideboard, wonderfully adorned with John William Waterhouse enchanting nymphs gazing into the lake. The fluid, lustrous greens, blues and golds are evocative of ethereal, tranquil water and the original polished, petal shaped fittings complement this piece perfectly. 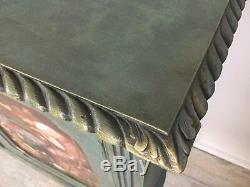 The interiors have been treated to dark wax to enhance the rich patina of the solid wood. 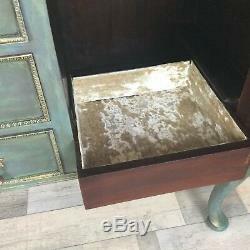 There are three large drawers and two large cupboards, one of which contains a sliding drawer lined with luxurious, oyster, crushed velvet fabric, all providing much needed storage. 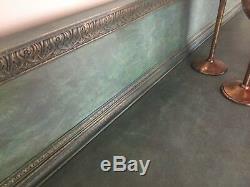 All of the paints used are mixed from Annie Sloan colours and sealed with protective wax. 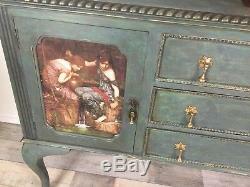 Why not treat your home to this completely unique statement piece. Alternatively you are welcome to collect yourself or to arrange your own courier, if you have any questions please message us. Only ships to United Kingdom from Swansea, Wales. 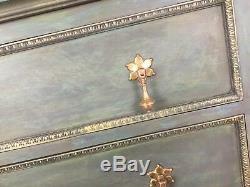 Original bespoke hand-painted furniture by. Where you can see my past and present projects. Which I hope you'll Like! 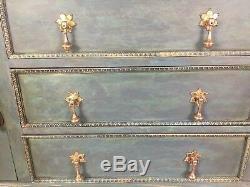 All items are lovingly restored and hand-painted. Some brush strokes may be noticeable. But these just add to the charm and character of the finished item. Please send your postcode for a quote. To UK Mainland Only - Not to Ireland. 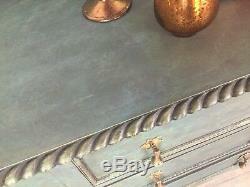 You are welcome to collect this item in person, or arrange your own courier service. Our postcode is Swansea SA3 4TR, (for you to get a quote). Please note: We cannot accept responsibility for any damage to furniture once it leaves our premises, the responsibility is with the collector. We would advise that appropriate protection is brought for the purpose of collection. 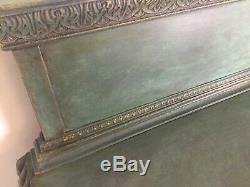 Any decorative items shown with the furniture in our photographs are for display purposes only and not for sale, Sorry! 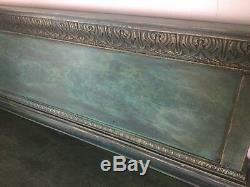 The item "Green Blue Vintage Sideboard, Living Room Furniture, Storage Cabinet, Upcycled" is in sale since Thursday, October 18, 2018.